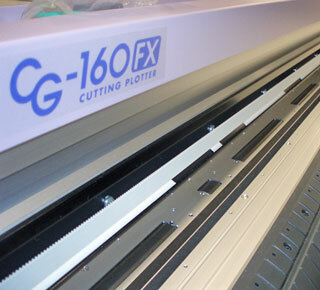 Using a roll stock vinyl, the material is cut on a plotter that reads the graphics image from a workstation. The vinyl is cut to the liner and then the excess is weeded out. An application transfer tape is then applied which allows only the vinyl graphics to be applied to the surface of the substrate. The vinyl stock comes in a vast array of colors which eliminates the printing stage. Multiple colors of vinyl can be applied to the substrate which results in a crisp and colorful finished product. Materials available with metallic, fluorescent, frosted etched and translucent finishes.